SAN FRANCISCO—California is weighing how to avoid a looming electricity crisis that could be brought on by its growing reliance on wind and solar power. Regulators and energy companies met Tuesday, hoping to hash out a solution to the peculiar stresses placed on the state's network by sharp increases in wind and solar energy. Power production from renewable sources fluctuates wildly, depending on wind speeds and weather. California has encouraged growth in solar and wind power to help reduce greenhouse-gas emissions. At the same time, the state is running low on conventional plants, such as those fueled by natural gas, that can adjust their output to keep the electric system stable. The amount of electricity being put on the grid must precisely match the amount being consumed or voltages sag, which could result in rolling blackouts. At Tuesday's meeting, experts cautioned that the state could begin seeing problems with reliability as soon as 2015. California isn't the only state having trouble coping with a growing share of renewables. Texas also needs more resources, such as gas-fired power plants, that can adjust output in response to unpredictable production from wind farms. 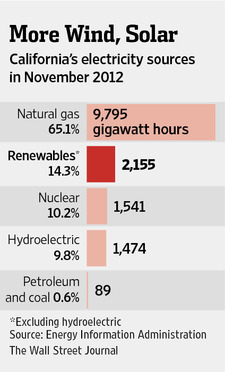 Renewable power has seen a boom in both states. On Feb. 9, wind farms in Texas set a record for output, providing nearly 28% of the state's supply for the day. Production hasn't hit that level yet in California, but the state's goal is to get one-third of its electricity from renewable resources by 2020. "I think we're going to end up closer to 40%," said Robert Weisenmiller, chairman of the California Energy Commission, the state's policy and planning agency for electricity. A decade ago, California was hit by an electricity crisis marked by price surges and rolling blackouts, stemming from market manipulation and tightening electricity supplies in a newly deregulated market. To prevent a recurrence, state regulators passed rules requiring utilities to line up enough energy to meet even high power demand, with a special emphasis on in-state renewable resources. "California has been well served by the procurement process since the crisis," said Steve Berberich, chief executive of the California Independent System Operator, which runs the state's grid. "The problem is we have a system now that needs flexibility, not capacity." Changes in California's market have attracted lots of new generation; the state expects to have 44% more generating capacity than it needs next year. Grid officials say they expect the surplus to fall to 20% by 2022, though it will remain high for about a decade. However, the surplus generating capacity doesn't guarantee steady power flow. Even though California has a lot of plants, it doesn't have the right mix: Many of the solar and wind sources added in recent years have actually made the system more fragile, because they provide power intermittently. Electricity systems need some surplus, so they can cover unexpected generator outages or transmission-line failures, but having too much can depress the prices generators can charge for electricity. In part because of low power prices, many gas-fired generation units aren't profitable enough to justify refurbishments required by pending federal regulations under the Clean Water Act. That means they are likely to be shut by 2020, adding to the state's power woes. By July, state officials hope to have a plan in place addressing the problem. Turf issues among state and federal regulators could complicate the process. Michael Peevey, president of the California Public Utilities Commission, which regulates utilities, said action is clearly needed, but he isn't sure whether the market needs "small adjustments or a major overhaul." Utility executives are calling for immediate action, pointing to the risk of rolling blackouts. "We see the issue hitting as soon as 2013, 2014, 2015," said Todd Strauss, the head of planning and analysis for PG&E Corp., a big utility serving Northern California, who attended Tuesday's meeting. "If we thought it was far out, we wouldn't be here." What happens when renewables cause brownouts or blackouts? Demands for non-renewables. What happens when there are more non-renewables than needed when the renewables require replacing? Cancellation of renewables. This is the way of the future: renewables that are stable or dependable, within a dominantly non-renewable. The market will push renewables into their proper places and proportion of the mix. The proper response, but backwards, will all the excess monies gone to waste. 1. The thermal gradient (AKA “effective lapse rate”) is pre-determined by the force of gravity, the weighted mean specific heat of the gases in a planet’s atmosphere (at that altitude) and the degree of intra-molecular radiation which, in the case of Earth, is somewhat dependent on the percentage of water vapour which, as is well known, makes the gradient less steep. Energy Efficiencies are very hard to predict. As the economy changes so does the public's attitude about saving money on their bills. I would bet that if the economy came back strong and California was financially health, efficiencies would start to erode. That is a winning bet on my side as I have seen this in the past and present. It is part of my job at a large utility company to guess daily, weekly, monthly, annually, and even beyond energy demand for our customers.